Station Eleven is the best novel I have read this year. 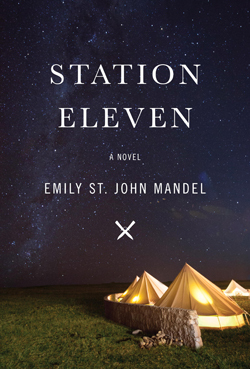 The 2014 genre-bending, post-apocalyptic, award-winning effort from Emily St. John Mandel was the seventh book I have read in 2015. Admittedly, I didn’t think it would be as good as it was, and I only picked it up because it was so highly recommended. I don’t always trust reviews from critics; there is less frequency of trust when it comes to friends’ reviews. But I want you to take my word for it: Station Eleven is compelling, well-written, and poignant. It is a novel that you have to read. It’s about Kirsten and her friends of traveling actors and musicians twenty years after a flu wiped out 99% of the world’s population. It’s about Arthur, an insanely famous actor, and his life (and wives) leading up to the flu. It’s about Javeen and the immediate aftermath of the flu. Stories are woven together beautifully to piece together intimate stories, but also paint an exquisite portrait of the Georgia Flu and it’s affect on the world. There is some immediacy to the story even though the reader partially knows the outcome. Yet, it doesn’t feel like The Walking Dead. There aren’t many sword fights or scavengers causing problems. Instead, it feels more like a BBC series exploring the post-apocalyptic world: slow and drawn out. Mandel weaves together small pieces of information that all become interconnected. Kirsten was a little girl acting in the same play Arthur was the night he died. She has some materials that Arthur’s wife had created, which link Kirsten to a mysterious figure later. Javeen was the one who performed CPR on Arthur as he lay dying, and later is loosely tied together with the plot twenty years later. We even briefly meet Clark early on in the story, then disappears, until he becomes a pivotal player in the events. It is not a mystery thriller, but there are mysterious events that Mandel teases the reader with to figure out, and there are thrilling moments that push the pace forward. While the 333 page novel is split between numerous characters, none of them are shorted in quality time spent with the reader. If the number of pages a character appears on is small, that does not mean a connection does not take place. Moments of heartbreak appear throughout: a little girl not remembering her face, a woman not understanding that the world has ended, a brother committing suicide because the chances of his sibling surviving after the world ends would significantly improve without his hinderance. These fleeting depictions of humanity in a world where humanity no longer exists leave the reader with a deep understanding of who these people are. Station Eleven and its characters left me content with where their story ended, but so intrigued on where they were going and what would happen. It is a novel worth devouring and I suspect that once you pick it up that you wouldn’t put it down until the last page is read.